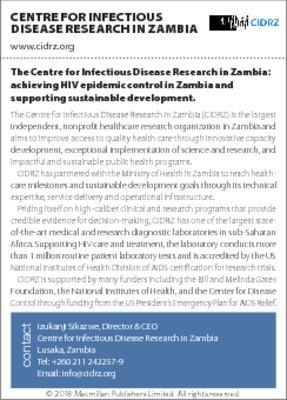 Centre for Infectious Disease Research in Zambia (CIDRZ) is an independent Zambian non-profit company, registered as a non-governmental organization and governed by a majority Zambian Board of Directors that is committed to answering key research questions relevant to Zambia and the region. It supports the financial, and technical local ownership of high quality, complementary and integrated healthcare services within the Zambian public health system, and facilitates clinical, research and professional development training. Through close and on-going collaboration with the Government of the Republic of Zambia's Ministry of Health and other line Ministries, and by partnering with multiple leading local and international universities, it ensures that the latest research methodologies are used to answer locally-relevant questions to improve healthcare delivery. CIDRZ runs several fellowship programmes that are aimed at building capacity of Zambian researchers to participate in finding solutions to health challenges.